Cloudy, cooler weather continues to help moderate fire behavior on the Taixtsalda Hill Fire burning southeast of Tok. The fire, which started on July 23, is now estimated at 27,194 acres in size, an increase of 5,194 acres. However, the increase in acreage is due to better mapping rather than increased fire activity, according to the Alaska Division of Forestry. The fire is burning in a remote area approximately 14 miles southwest of the village of Northway and 38 miles southeast of Tok. It is approximately 20 miles west of the Alaska Highway. As of Friday night, there were still 156 personnel assigned to the fire but the Type 3 incident organization that was managing the fire will transition to a smaller Type 4 incident on Monday, August 6. Demobilization of equipment, resources and crews will begin today. The last four crews working on the fire will be released and operations scaled back to monitoring the fire by Tuesday. Light rain was falling over the fire area Saturday morning. 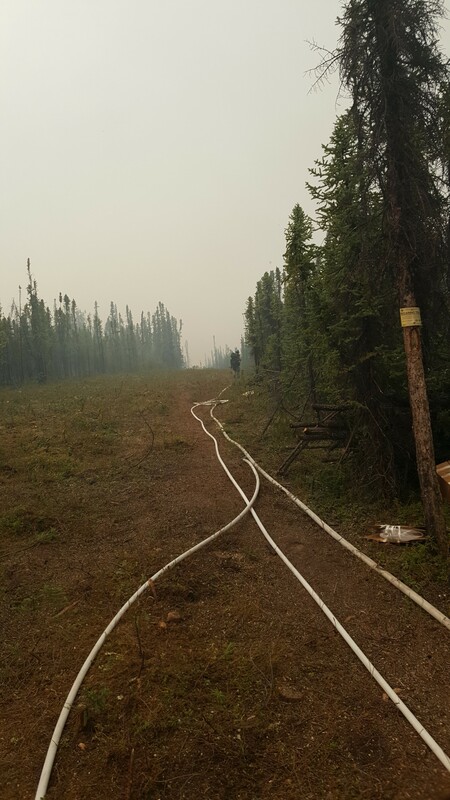 Protective measures in the form of fire breaks, hose lays and sprinkler have been put in place and are now complete around cabins, Native allotments, a radio repeater and weather station nearest the fire, if needed. The temporary flight restriction remains over the fire area to provide a safe environment for firefighting aircraft as equipment and crews are extracted from the field. There are multiple firefighting aircraft flying in the area. To check on the coordinates of the revised TFR, pilots can go to http://tfr.faa.gov/save_pages/detail_8_8698.html. This will be the last update on the fire unless significant fire activity occurs.